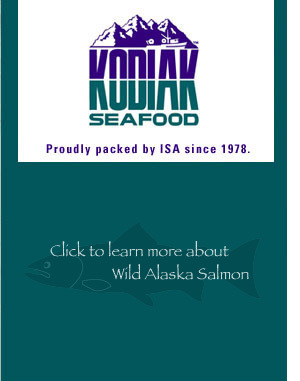 Kodiak Seafood - Premier line of seafood packaged in International Seafoods of Alaska, Inc. This is where Kodiak Seafood is harvested and processed. In these pristine, natural surroundings Alaska seafood swims wild and free, developing the superior textures and flavors that truly distinguish it from seafood harvested anywhere else in the world’s oceans. Kodiak Seafood is the premier line of seafood packaged in International Seafoods of Alaska, Inc. Unrivaled superior quality fresh and frozen seafood products  salmon, cod, pollock, halibut, rockfish, roes, soles and flounders  to name but a few. With our processing facility on Kodiak Island  centrally located in the Pacific’s Gulf of Alaska  we have ready access to the world’s finest and most bountiful seafood resources, ensuring that our customers receive the best quality seafood products delivery after delivery, all year long.